Salesboom has been creating CRM software since 2003, with a focus on customer-support and sales force automation. Every Salesboom client receives a dedicated CRM consultant who helps with deployment and implementation, and advice on best-practices. Phone and online support is also free with any CRM subscription. 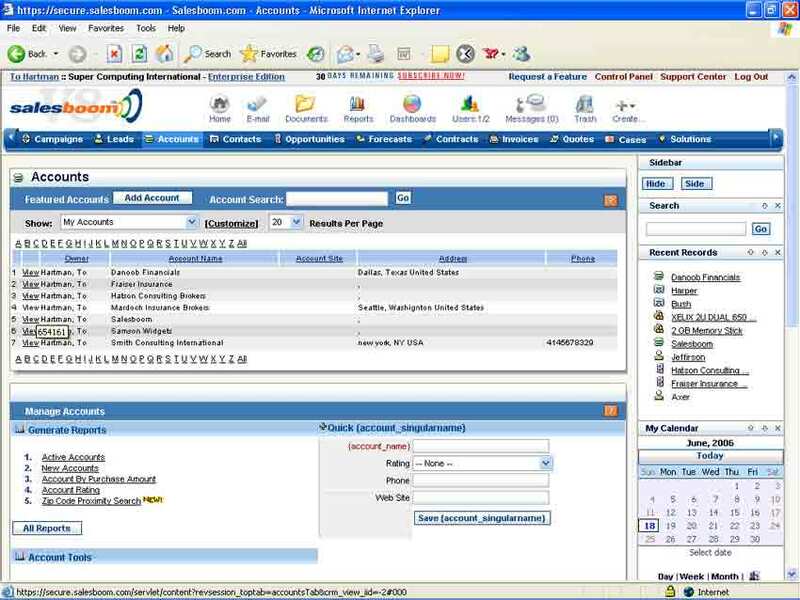 Salesboom CRM is used by companies such as Gannett and Honeywell. Salesboom’s platform is cloud-based, and comes in three different tiers – team, professional, and enterprise. The team version allows for mass emails, automatic lead response, and contains numerous sales force automation features like contact management, lead management, and sales forecasting. The professional version includes campaign management for marketing, in addition to knowledge base management for customer service centers. Finally, the Enterprise version includes quote management, automatic product databases, and commission’s management, along with a custom company-specific analytics dashboard. All levels include a CRM consultant, and phone support. As a cloud-based CRM, Salesboom can be accessed from almost any device, including web-enabled mobile devices. Their solutions can be used by companies in any industry. Salesboom also has specifically tailored solutions for numerous industries, including defense, call centers, financial services, legal, government, and pharmaceuticals, among others. Not sure if Salesboom is the right fit for you? Review the top CRM Platforms with our Product Selection Tool, or if you’d prefer, call, click, or email to speak with an unbiased Technology Advisor for a no-cost, no-obligation consultation on your unique needs. Learn everything you need to know about Salesboom. Our experts will reach out to you shortly.